On January 30th, Randa Scott, Director of Vocation and Professional Development, presented at the Student Lunch and Learn. The Résumé Workshop consisted of tips, handouts, and mentors for students needing guidance on their résumés. Randa Scott began her presentation with résumé basics which consisted of proper formatting, making the top 1/3rd of the résumé stand out, and how to craft impressive accomplishment statements. During her presentation, Scott spoke in-depth on each of these elements, helping students understand and learn how to fine-tune their résumés. With her advice, Scott taught students how to study job descriptions, look for descriptive words, and develop a summary of qualifications. She also showed students what an experience section should look like and how to impress future employers with this. 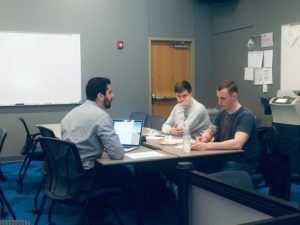 After the Student Lunch and Learn, Scott and members of IncubatorCTX were standing by to coach students one-on-one to hone their résumés. Students learned what employers were seeking in candidates and received practical hands-on advice to prepare them as they apply for jobs and start their careers upon graduation.